'Buster Keaton' mural (Howard Tharpe, 2002) in Cottage Grove's Historic District. Large-scale public paintings are "the people's art works." Everyday ordinary traveling families don't have to worry about making a special trip to a museum or step into an art gallery to be exposed to local creative expressions and a little bit of history. Many smaller communities across America are enhancing their downtowns with huge murals that reflect the historic events of their region. 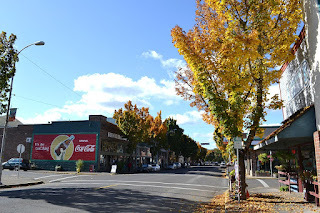 Cottage Grove, just south of Eugene in western Oregon, is one such community. With a population of around 10,000, it is home to 20 murals that tell the town's stories and "colorfully illustrate" the community's character. Historic Coca-Cola mural on Main Street in Cottage Grove. One such mural depicts the silent film star Buster Keaton in one of his best known films, 'The General.' In 1926, the film was made in Cottage Grove and the surrounding area. "The movie included a spectacular locomotive crash, and the wrecked train became a minor tourist attraction until it was dismantled for scrap during World War II," according to historic reports. 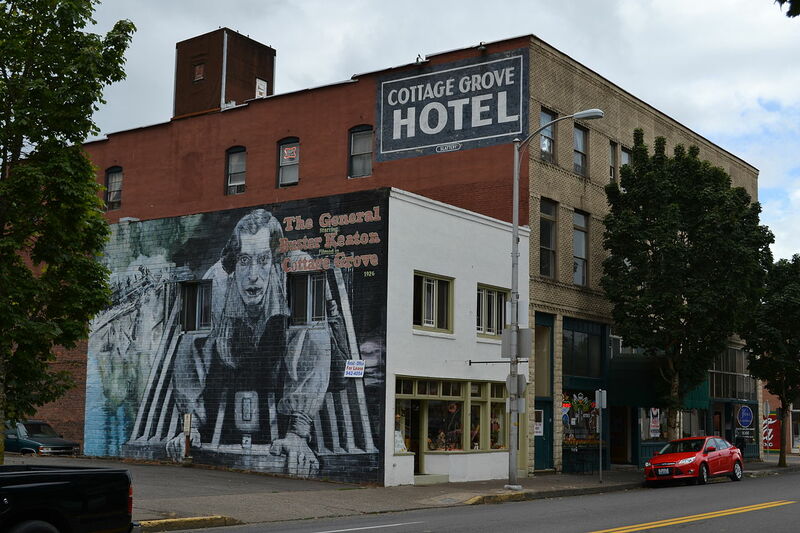 Another nostalgic mural captures Cottage Grove's 1920s' Main Street. This black and white rendering was painted by Connie Huston from an actual photograph of Main Street almost a century ago. Click here for the Cottage Grove, Ore., Scenic Murals Directory and Map. To read more about other family-friendly things to do in Cottage Grove, the "Covered Bridge Capital of Oregon," click here. To read more articles about the RV lifestyle by Julianne G Crane, go to RVWheelLife.com. Photos and information sources: Cottage Grove Mural Committee, Lane County, EugeneCascadesCoast.org, Oregon's Secretary of State website, Wikipedia. Awesome. Who doesn't love outdoor murals and these are great! These murals are really fun, scattered through a delightful historic district with several cool places to eat lunch, drink a latte or walk through a covered bridge.